Individuals, organizations, businesses and governments often need document translation services to do business with their stakeholders, including clients, employees, or business partners. 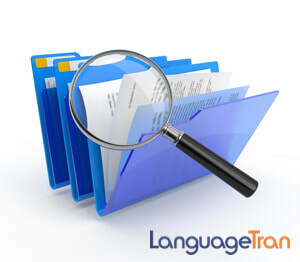 LanguageTran offers the resources and expertise that normally, only a few large corporations can access to translate documentation into any language for any size project. With an ever increasing need to launch their services and products in a multilingual marketplace, companies face the daunting task of creating, updating, and formatting documentation in multiple languages as fast as they created it in the original language. This task is often complex and involves project management skills, quality procedures and a team of expert translators. Companies, individuals and organizations need professional document translations to communicate accurately and effectively across many languages. LanguageTran has the experienced project managers, translators and proofreaders needed to provide high-quality translation solutions in a cost-efficient manner. Finding the right translation team is the single most important decision you can make to lead your document translation projects and that is why we are willing to provide you references, samples and a competitive quote for your peace of mind. Our company is an experienced translation company, working since 2001 to bring together an extensive, expert team of project managers and specialized translators working into and from many of the world’s languages, and all major ones. Our team is ready to address all your document translation needs, from small documents to large and complex multilingual projects. We offer an approach that is centered around the client, guaranteeing your satisfaction. Our company is 100% committed to providing the best document translation services for our clients. We have translated thousands of documents for large and small clients, from brochures and books to business and scientific documentation. Accuracy, consistency and grammar comprise the metrics we use to ensure the quality of your business translation. Our service to you is based on those three variables, and we stand by that throughout our business relationship. Assign work to the right team members (project manager, translator(s), proofreader(s), formatter(s)). Prepare and approve the project-specific terminology glossary. Use of state-of-the-art translation management software to ensure consistent terminology and accurate translations. Translate, proof-read and format the document. Global businesses face the daunting challenge of communicating with their constituencies across many languages and cultures. This is not an easy task and it requires special skills and tools to manage translations, versions, updates, formatting and publishing in a timely and cost effective manner.